Fall is officially here, and we say there’s no better way to embrace the season than by creating some crafts that will keep you cozy all autumn long. Here at Alta Brighton Park, we love fall almost as much as we love a good DIY project. That’s why we’ve rounded up a few of our favorite fall crafts to keep you busy as the weather turns, whether you’re looking to plan a crafternoon with friends or knock out a project on your own. Remember this easy-to-do craft from when we were kids? If not, you’ll pick it up quickly. To latch hook, you use an inexpensive tool to pull short pieces of yarn through a stiff woven sheet. It’s the perfect project to start with if you’ve been spending your summer outdoors and neglecting your crafting skills. It’s simple, cheap, and something you can do while chatting with friends or watching your favorite fall movie. Latch hooking is kind of like paint-by-number for weaving. You can pick up a latch hooking kit from your local craft store. When you’re done you can simply hang your shag weaving on the wall or sew it to the front of a pillow! While weaving may seem intimidating at first, it’s really a pretty easy craft to master, especially if you start small. Lauren Conrad herself has an awesome tutorial on how to get started weaving small scale. In her DIY, she teaches you how to use the back of an art canvas and some push pins to make your own homemade loom before you commit to buying a real one. All you’ll really need is a small canvas, push pins, string, and yarn to begin! Ah, knitting, a staple in fall crafting. If you haven’t fallen in love with it already, make this the year you nail knitting! 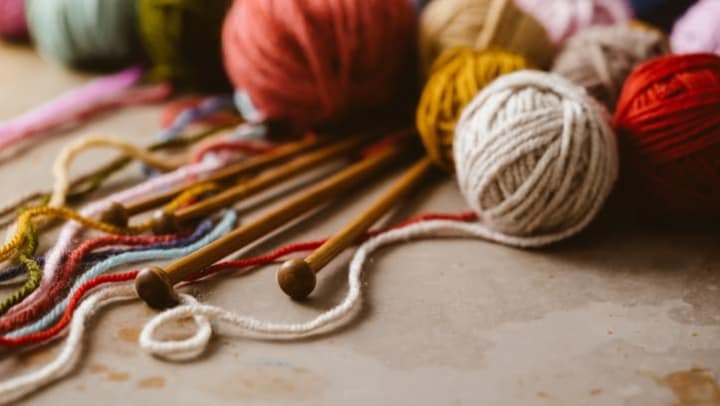 Maybe you’ve tried knitting before but mixed up your knit and purl stitches or got impatient after knitting dozens of rows and your scarf still wasn’t done. Instead of making your first project something difficult, choose a beginner-level pattern and attempt it in a fall color so you feel motivated to get it done this season! To make this cozy, cute pillow for example, all you have to do is knit a square and attach it to a back, then stuff it. Carving a jack-o’-lantern can be a lot of work, and if you don’t do it close enough to Halloween, your pumpkin might fall in on itself before trick-or-treaters even get to enjoy it. Ever thought of painting your pumpkins instead? It allows them to last longer, gives you flexibility with color and design, and you can still cook with them or toast their seeds once you’re done with them as decorations. Paint black polka dots on a white pumpkin, blend a couple hues to give your pumpkin ombre, paint it a color not usually associated with the season, like pink, or add some glitter to up your pumpkin game! You’ve made it to the end of our list and you’re feeling ambitious. Nothing says fall like a scented candle, so why not take an afternoon to make your own? This how-to video shows you exactly how to make candles at home with beeswax, coconut oil, natural candle wicks, essential oils, and repurposed jars. Just choose essential oil fragrances that say “fall” to you and create a candle you can burn all season. Looking for even more ways to make Alta Brighton Park feel like home? Visit our blog.